Many smartphone users are storing everything and the kitchen sink on their smartphones these days, including data that is of sensitive nature such as passwords, credit card data, etc. It's in their best interest to have contingency plans should their device ever fall into the wrong hands. 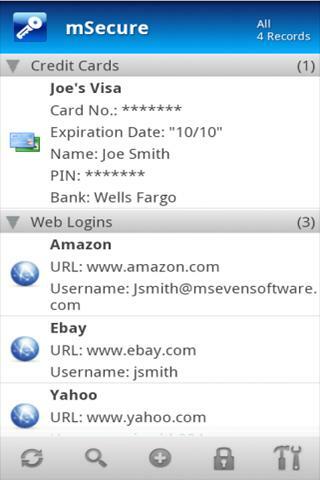 This is where apps such as mSecure - Password Manager come into play. What exactly does this app have to offer? You'll find out in today's review. The app is 8,31 MB, and the required permissions seem kosher save for the one that asks to access a user's email. Both the 3.1.3 and 3.1.4 versions of the app state this odd permission request, and as I couldn't quite see the point to this, I checked the developers' website for more details. "Your messages - Read Email attachments/Read GMail. Allows this application to read your mSecure backup email attachment when performing a restore operation." Then, after you start the application, you will have to set up a password via which the app can lock. The main screen harbours the entries you made of you data (more details in regards to this in the next section). Should you have made too many entries, use the magnifying glass icons to search for specific ones. The circular arrow, which is normally used to refresh a page, serves as a sync with Dropbox or a WiFi network button here. Should you not wish to use the WiFi connections to sync your data, you may also do so manually using the connection and IP address/port number. And now–on to the controls! I was a bit surprised to note that there's no introduction to the app for first time users, but soon realised that controls are extremely intuitive and it takes but a few moments to figure out how to secure data. Hit the '+' icon at the bottom of the screen in order to add a new record that you wish to back up; the entry form for records will then pop up. Choose a category via the menu above and enter your record. There are 17 categories in total to choose from, and you may enter anything from bank accounts to birthdays to credit card numbers to registration codes and even internet registration data. If ever you wish to enter a record that doesn't quite fit into any of the available categories, you can go for the 'non classified' feature. Enter a password and then hit the key icon; you will then land in the integrated password generator from where you may create a new password that is 5-30 characters, upper and lower case and numbers and special characters can be set to automatically back up. Once you've entered all the data, select the icon on the right that bests corresponds to your entry. The entry will then be saved as soon as you click on the disk icon, and it will appear on the main screen. Entries are sorted alphabetically, but if you wish to display them differently simply press the menu button for further options. Entires can also be edited, deleter or shared via the menu. When closing the app, hit the key icon in order to put it under lock and key. Whenever you wish to access it you will ahve to enter a password. You may also select after which time interval mSecure - Password Manager should lock itself (for instance after your device has gone into sleep mode). A small bone of contention: when entering a password you may switch between an alphabetic and numeric keypad, but the system does not seem to recognise a correct entry. At least, this is true to my experience; my password contains letters and numbers, and I tried to enter it several times without success. Furthermore, the numeric keypad is not available, meaning numbers have to be entered using the standard keypad. Rather annoying. mSecure Settings: Change your password; determine the time period after which the app goes on automatic lock down (i.e. when your device goes into sleep mode); determine after how many wrong password entries your secure data is to be destroyed; determine if data should be masked. Data settings: Group and type lists can be edited here; standard types can be restored. Group types can be renamed (pre-settigns include 'personal' and 'business'); categories can be deleted and new categories can be added (using your device's menu button); templates can be renamed and edited. Alternatively, you can add new fields and change them (names, field types, display in the main screen and treatment of sensitive data on/off), or remove fields. Backup-Operations: Go here for everything that has to do with settings up backups such as syncing via Dropbox or WiFi. An extra security password is required for syncing via your device and Dropbox. Screen settings: Go here to alter the display's layout: viewing mode (auto, portrait or landscape mode), font size, language and notification symbol. This is also where you can come to ask support questions, access information related to the app and its developers and recommend the app to your friends. Furthermore, you may create backups to your SD card and restore these using your SD card, send a backup file to your Gmail account and select how many automatically generated backups are to be saved to your SD card at a time. All this talk just to say: mSecure - Password Manager is a wonderful security service. Syncing data is a cinch, controls are nice and intuitive and there are a lot of options to help users personalise the application. The application is well thought-out and constructed and on the whole relatively easy to use, despite its scope of available features. 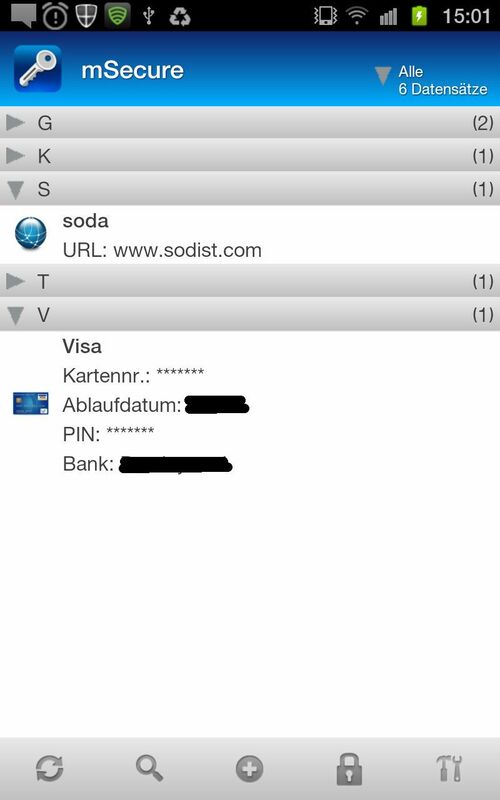 On the whole, mSecure - Password Manager performs very well: it is both stabile and smooth. Some menu option take a bit longer to load than others. This is mSecure - Password Manager's one drawback: it costs a whopping EUR 9,27. While you do get a lot for your money, bear in mind that the desktop version (for Mac or PC) will set you back an additional US$ 20 (EUR 15,40). 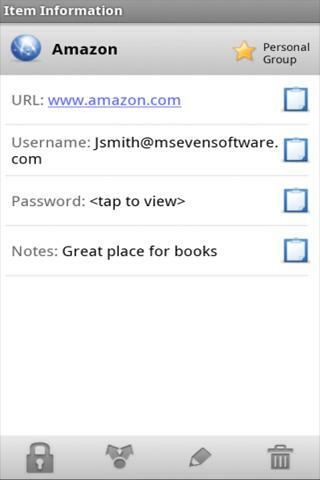 mSecure - Password Manager is our app of the week and this week only it can be downloaded for EUR 3,99. Intuitive Password (IntuitivePassword.com) is another one which should be considered. it's a cloud password manager that compatible with all devices without installation, you can access your password database at anytime, anywhere using any Internet connection. @smerrit: well put, and thanks so much for commenting! I love this apparently. although it is pricy, the information it protects is more valuable. it is easy to add, edit, and categorize. I would recommended this to anyone who has a plethora of logins and passwords, etc.